I served many different Churches before I finished College and Seminary. 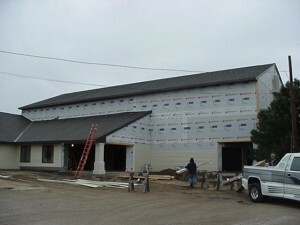 It started with ministry efforts at Martin Road Gospel Chapel in St. Clair Shores, Michigan. Those were wonderful days for us. 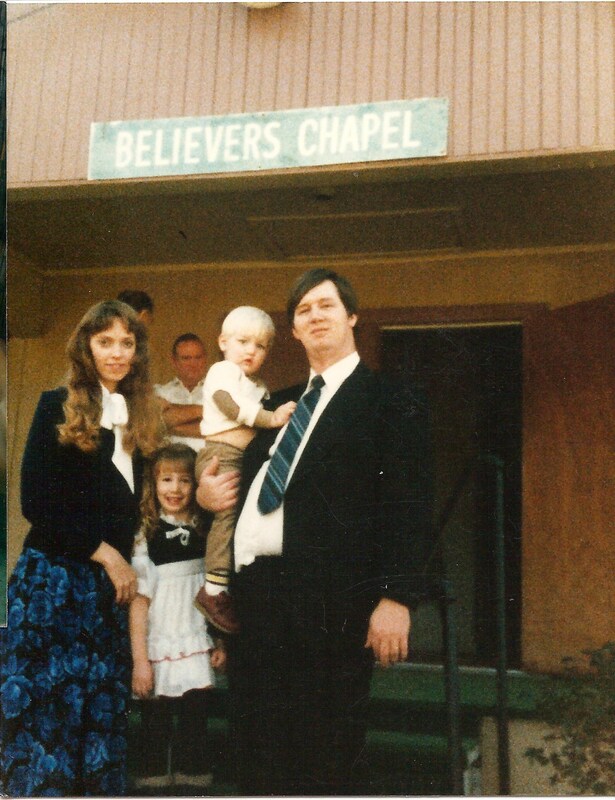 I had the privilege of preaching several times at Martin Road Gospel Chapel in the early 80’s not long after I became a Christian. One of the benefits of being associated with the Assemblies is that the expectation was that all men would be able to share the load of the ministry and all who were able were expected to preach on occasion. 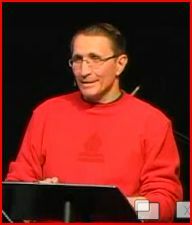 I’m not real proud of those early sermons, but one day I’ll put the audio versions of them up on the website. But not now. We used to host the young people’s group at our house in Roseville, Michigan. We really enjoyed that. It was most every Friday night and there were anywhere from 5 to 25 people there. We became very close to these people from Martin Road Gospel Chapel. I don’t think we’ve ever been as close with a group again. We hated to leave them for Seminary and they hated to see us go (I think!). 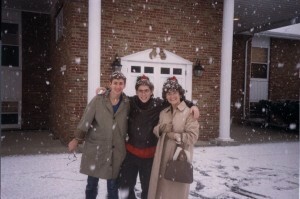 During Our Seminary years we did various ministry jobs at a couple different churches. 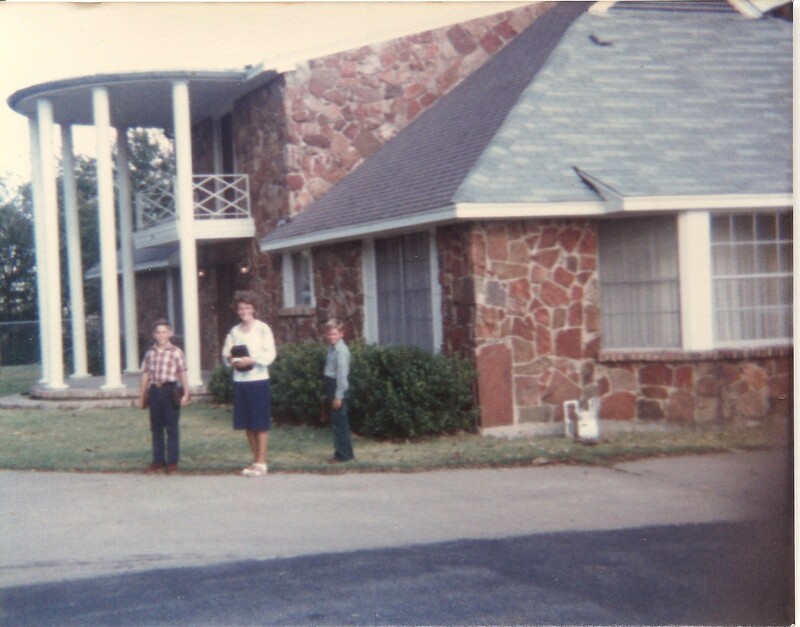 We started at Garland Bible Chapel, and except for a short time at Garland Bible Church, with the Lamberts, most of our attendance was there. We did everything from help start an Awana program to preaching. It was an interesting time. Mostly, difficult, because the relationships we built at MRGC, didn’t materialize there. We were hired as the janitors for the church. 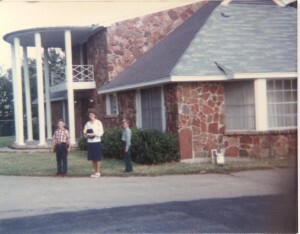 When we moved to East Texas to be with Dallas Bible College, we went to Believer’s Chapel in Golden, Tx. It was a very small group of believers and we made better friends there than in Dallas. We were very involved in the ministry in many ways. 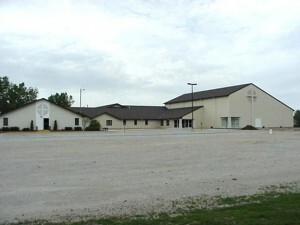 It was a great place for me because I had many opportunites to preach at that small Assembly and it helped me develop. I truly needed the experience and was very grateful that they allowed me to preach. As I look back on those days, it’s amazing that they survived me. I was really filled with zeal but little experience and even less knowledge. I owe the group in Golden, TX a lot for giving me those opportunities. When I went to Dallas to received the Doctorate Degree, Kathy, Chuck 3rd, and I went to Golden to visit them and I was really astounded to see all the same people still going there. It was nice to see them all and we enjoyed it a lot. It was about the very same people nearly 20 years later. Well, think about it! Kathy and I really enjoyed our time there and we learned a lot about people! Seminary doesn’t teach you much about the real ministry. It teaches about theology and homiletics, and hermeneutics, and Greek and Hebrew, but doesn’t help you learn how to work well with people. Since that was my weak suit. I made a lot mistakes both at Garland and Golden while trying to get experience in the ministry. It was good for me and I deeply appreciated everyone who put up with me. They were truly gracious, gentle, forgiving, and encouraging. 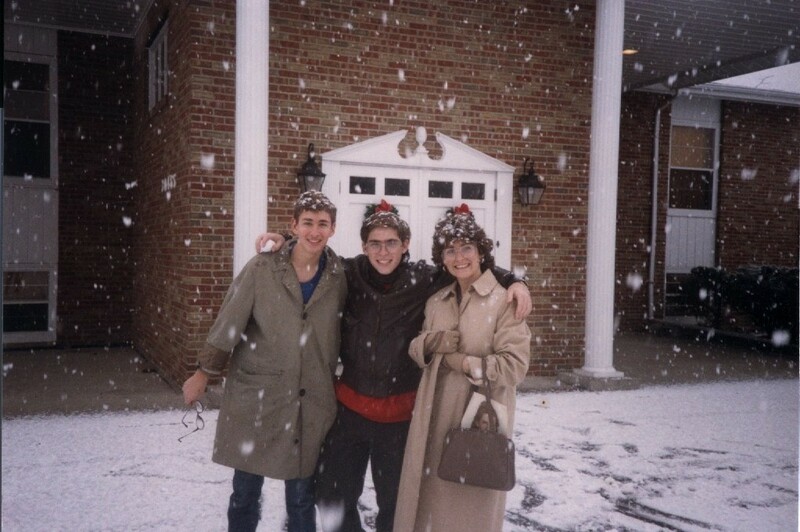 During my final year at DTS, we took a trip back to Michigan in December 1986. We visited Hillside Bible Chapel and talked with David Reid and others who had started going there after leaving Martin Road Chapel. They were negotiating with several men regarding a Full Time Worker. The one they were considering withdrew and they invited us to come and be a candidate for the position. 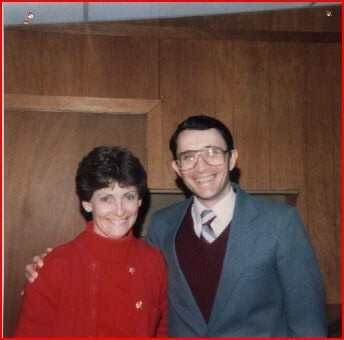 We did that and received the call to ministry there and moved there in June 1987, immediately after graduating from DTS. It was a great place to start because I still had Navy Reserve Obligations and they had no problem with my not preaching half of the time. As a matter of fact, they did not want me to preach more than half of the time. That worked out well for me. I made some interesting contacts as well and met the head of the Bible Department at William Tyndale College, my Alma Mater, and he asked if I’d like to teach. I took Greek I, and Greek II, and even did an Advanced Greek Seminar on Ephesians over the years as well. I truly enjoyed my instructor duties at William Tyndale College. Although I had taken Greek at William Tyndale College in 1981 and 1982 and then again through my years at Seminary, I don’t think I really learned it nearly as well as I did after teaching it for several years. I’ve done lots of work in the language and probably could publish a Greek Grammar if I had the chance to teach it some more, and I just might do that some day. 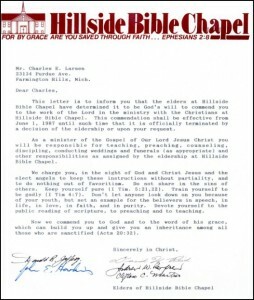 I stayed at Hillside Bible chapel for four years. 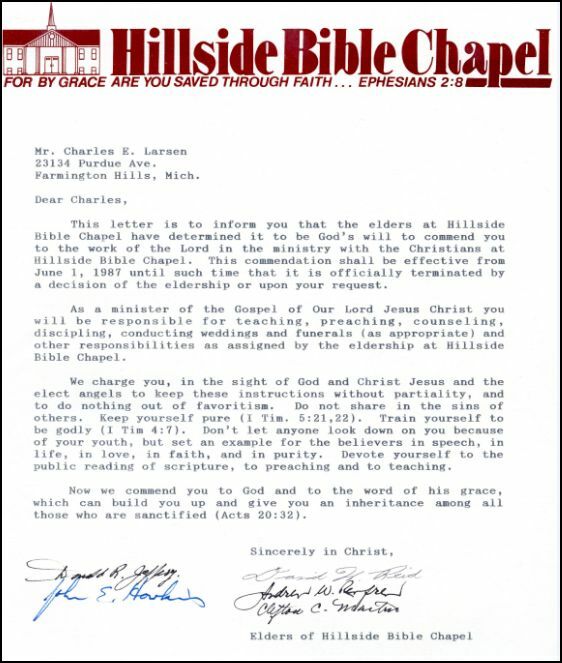 The Elders there bought a house for us in Farmington Hills, MI which was in the same city that the Chapel was in and it was a pretty nice house. 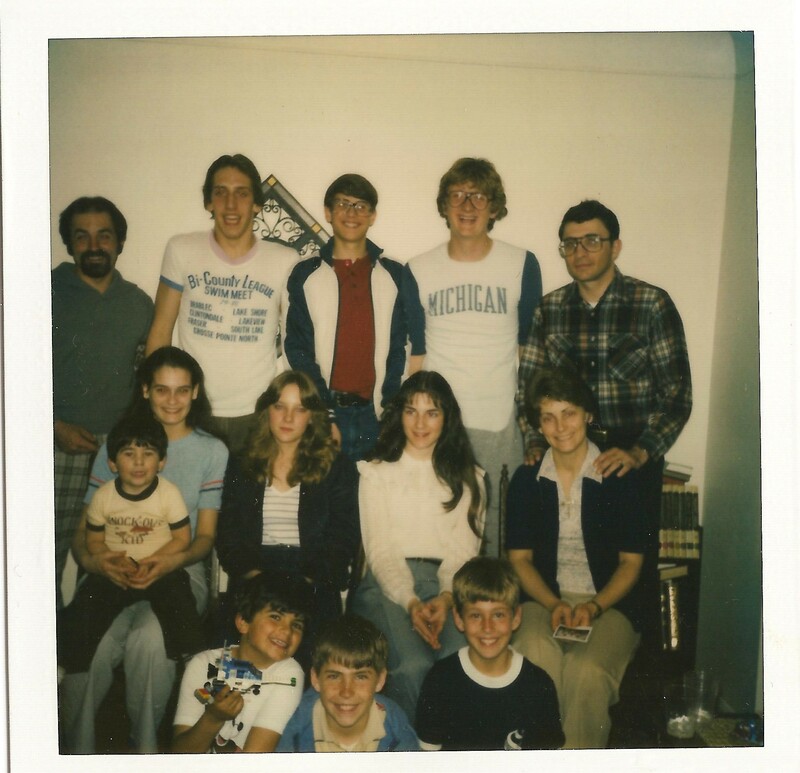 That city was in Oakland County which was one of the most wealthy counties in Michigan at the time from what we understood, so it was great to have had a house there. The payments were a little higher than we could afford because we were paying tuition for the boys to go to a Christian School and I wasn’t making that much at all. I took a $10,000 pay cut from 1982 (my last year in the Navy) and 1987, my first year in ministry. And that after four years of Graduate School! Well, that’s the ministry. 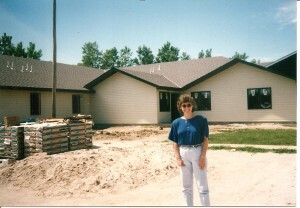 We moved to a nice house in Redford for the last couple of years with less mortgage and more features. It had a garage and long drive way, etc, that the house in Farmington Hills didn’t have. And it was in a more modest area. We fit in better there and enjoyed our house there a lot. Hillside Chapel was a nice little church, but it was very small. It sat about 100 and we just couldn’t lead the group to want to make the necessary changes it had to make to grow. I got terribly frustrated and we decided to leave the Plymouth Brethren and go to a true non-denominational ministry. 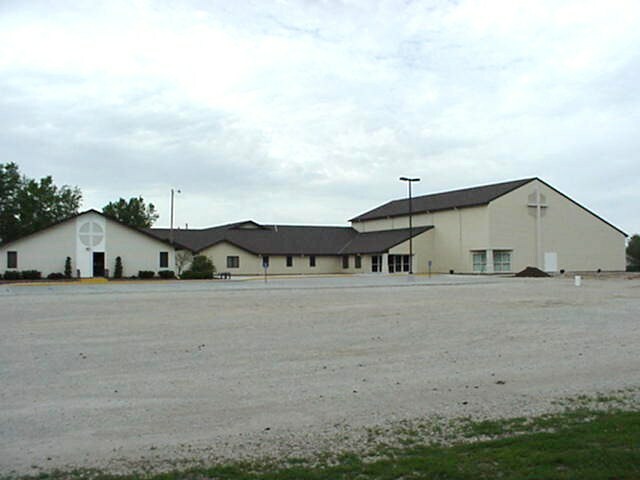 We were candidates for the Sr. Pastor position at Beaumont Bible Church in Beaumont, TX. It was a fun trip down there and we enjoyed our week end, but when Country Bible Church offered us the position in Nebraska, we decided we’d like to come home. It’s only 30 miles from Omaha and it brought all the family there back into our lives. We were offered the position in Beaumont also, and that was encouraging, but we never seriously considered it. 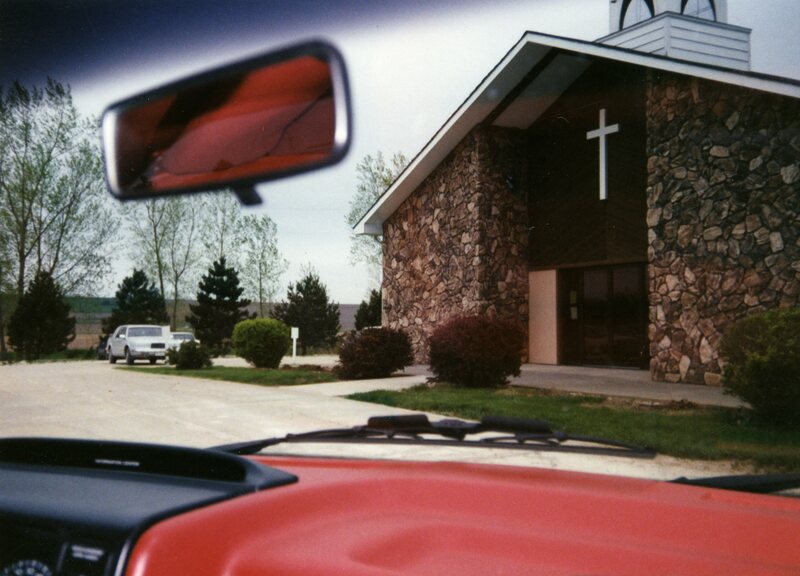 We came to Country Bible Church on Palm Sunday 1991 and preached at the service and interviewed with lots of groups and after the service, we went to a member’s house while they voted. We got the necessary 90% vote and received the call to come on July 1, 1991. We’ve been here every since. After we received the call, the President of William Tyndale College took Kathy and I out to lunch and offered us both full time positions with the school. He offered to allow me to create a biblical languages department and that was really tempting, but we had already told the folks in Blair that we were coming. So, that settled that. Country Bible Church sat about 200 people in their sanctuary and we average 100 people the first couple of years. I was disappointed because the first couple months there were about 150, but once they got used to me, or the novelty wore off they disappeared. We were down to about 75 people a Sunday. 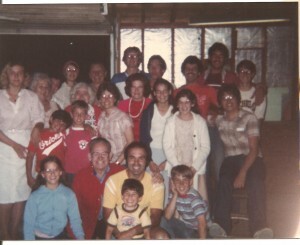 But we grew and added several services and by 1996 we were at about 300 and needed more room. We went to three services and built what we call the west wing. It was primarily an education and an office wing. We finished that in 1997. 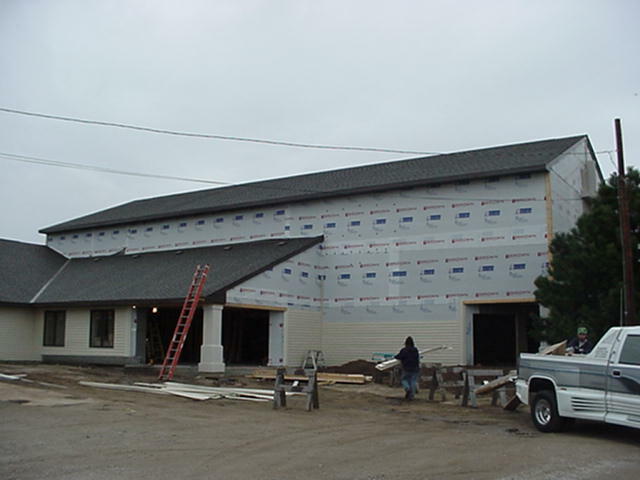 We continued to grow and reached about 500 in 1999 and started a new sanctuary building project. Some families were unhappy with the building project and my leadership (I think!) and left the church at that time so by the time we finished building the new sanctuary we were at about 400. But God was good and we’ve consistently have grown over the years and today our average is over 600 on a Sunday morning. This Easter Sunday (2011) we have 1198 – almost 1200 at our three services. We’ve grown a great staff over the last two years and I expect with their contributions Country Bible Church will continue to grow. I’ve always prayed that I could stay active in ministry until the years 2020. I’ll be 73 at that time and so it’s not a given. But I’m confident that there will be well over 1000 regular attenders by that time. God has truly been good to us in this small city of 7500 people. I love my preaching responsibilities. I will preach about 80% of the time. I’ll be working with a young man who will assume the duties as Senior Pastor when I retire, and that will become less and less over the coming years, but for now, I’ll keep preaching as long as God allows it. I have so much freedom now after 20 years of ministry at this church that I get to do what I love to do and watch those much more gifted than me lead the church in many different areas of ministry. It’s a great joy to see how many people God is using to build this work. I’ve thought it has been extremely fragile over the years, but with the new staff, it’s becoming much more stable and I’m confident that after I’m gone it will continue to grow. I can’t thank God enough for how good he’s been to me and all of us at Country Bible Church. I remember Kathy asking me 20 years ago why I wanted to be at this little church in the cornfield. She just didn’t see it the way I did. Several times she has mentioned how astounded she has been with what God has done, and continues to do, here in Blair, Nebraska through the ministry of the many of us at Country Bible Church. We just love it here and are so grateful to God for it all! If he would take me home tomorrow, I’d have no complaints! 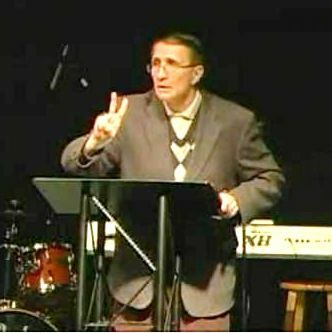 On January 15, 2017 (My 70th Birthday) I retired as the Senior Pastor of Country Bible Church.